The popularity of the Pro V1 and Pro V1x, ironically enough, presented a challenge to Titleist engineers as they considered how to move to the next iteration of the longtime favorite among tour pros and top amateurs. When 72 percent of PGA Tour players, 80 percent of LPGA Tour players, 73 percent of men's NCAA championship players, and 94 percent of women's NCAA championship players are playing either a Pro V1 or a Pro V1x, there is a risk to changing something that many people like just the way it is. But in listening to player feedback, the one request (because golfers can't get enough distance) Titleist heard was to try to squeeze a little more distance out of the ball without sacrificing the greenside spin and control that the ball is known for. The key was making the cast urethane cover 17 percent thinner and making the casing layer that contains the core 14 percent thicker in the Pro V1 and 11 percent thicker in the Pro V1x. They also formulated a new 2.0 ZG Process Core. The outermost portions of the solid core Pro V1 and dual core Pro V1x have increased in stiffness while maintaining their soft centers, creating faster engines with higher ball speed and lower long game spin. As with previous versions of each ball, the Pro V1 flies lower than Pro V1x with a penetrating trajectory and softer feel. The Pro V1x flies higher, spins more on iron shots and has a slightly firmer feel. 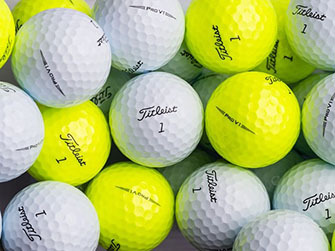 2019 will also mark the first time Titleist will make both balls available in yellow, which was actually a quite difficult process for the unique blend of materials making up the urethane cover. The yellow version of the Pro V1 and Pro V1x will be available March 23.